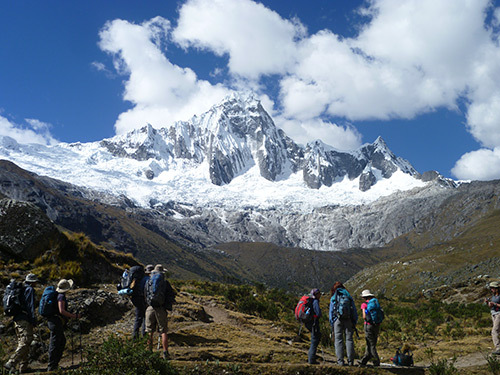 One of the most popular trek in the cordillera Blanca. it has the spectacular mountain views, crystal lakes and challenging pass. Along the trail we have amazing views of Artesonraju, Rinrijirca, Taulliraju ,Alpamayo and Quitaraju in our first pass we can see spectacular Taulliraju in our last Portachuelo pass we will also see Huascaran north and south , Chopicalqui, Huandoy, Pisco, Chacraraju after the pass we go down to the famous lake of Llanganuco Chinancocha and Orconcocha. After the breakfast in Hotel We will leave from Huaraz around 7 : 00 h. passanger will be transferred to the trail head Cashapampa at 2,900m. where our donkey drivers will be waiting for us , then we will start hiking by narrow valley ,we will go up for about 2 hours , then we will start going up moderate almost flat area to the first camp place Llamacorral at 3,700. Day 2: Llamacorral – Alpamayo Base Camp 4,250m. 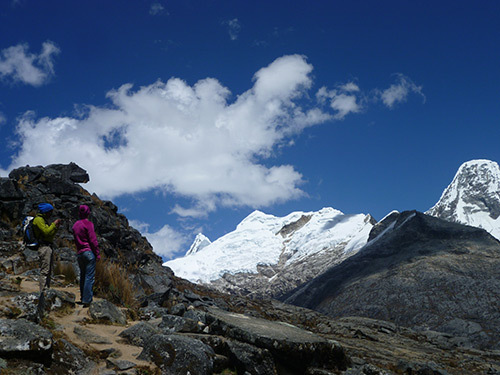 – Taullipampa 4,200m. After the breakfast we will hike along the valley moderate enjoying the lakes called Ichiccocha and Jatuncocha turquoise lakes ,We will have lunch at the place called Quisuar ,after we will go up t the Alpamayo south Base camp after to take picture we will return short walk and continue to next camp place Taullipampa . Day 3: Taullipampa – Punta Union pass 4,750m. – Cachinapampa 3,700m. In the morning after our breakfast in the camp we will start our hiking around 8:00 after 3 hour hiking up we will reach the punta union pass at 4.750m. from here we will have spectacular views the next mountains Taulliraju ,paria ,artesonraju and contrahierbas ,then continue hiking down to paria and cachinapampa camp. After the breakfast in the morning we will start going down for about 1 hour half and 30 minuts for go up to vaqueria where our private bus will be waiting for us ,then transport to Huaraz . 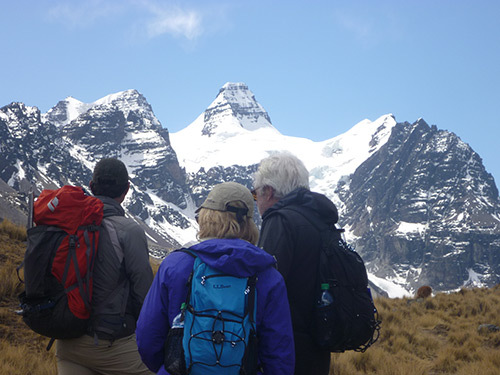 before to llanganuco lake we will arrive to portachuelo pass at 4,800m. 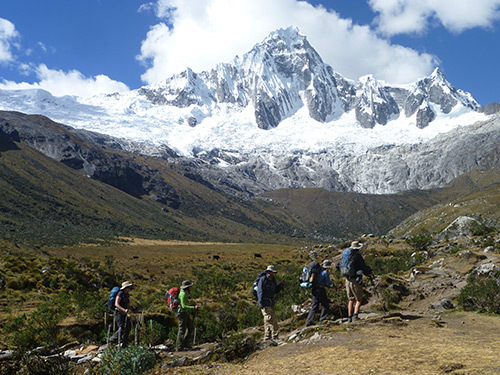 from here we will have amazing views of Huascaran north ,south ,chopicalqui ,huandoy peaks,pisco ,yanapaccha after we continue going down to llanganuco lake where we will have lunch then continue toward control of Huascaran National park yungay, Huaraz .